As the UK sent military advisors to Ukraine, on 11 March Article 36 wrote to the government urging them to do everything in their power to prevent any further use of cluster munitions by Ukraine. We also recommended that the Ukrainian government’s use of explosive weapons with wide area effects in populated areas be raised. Both of these practices have caused severe harm to civilians in Ukraine, causing casualties and destruction, and are a serious challenge to the protection of civilians in armed conflict. The 2008 Convention on Cluster Munitions (CCM) outlawed these weapons because of the unacceptable harm they cause to civilians. As a signatory, the UK has a legal obligation under Article 21.2 of the Convention to “make its best efforts to discourage States not party to this Convention from using cluster munitions”, and should encourage Ukraine to join the Convention. Our letter is available here and is reproduced in full below. On 10 April 2015, the Foreign and Commonwealth Office (FCO) replied that they were concerned at allegations of cluster munition use in Ukraine, and that Ukraine had been invited to an FCO reception on the universalisation of the Cluster Munitions Convention. No other action was described. On the use of explosive weapons with wide area effects in populated areas, the FCO stated “our view is that international humanitarian law (IHL) adequately regulates this area”. This ignores the significant humanitarian harm caused by the use of explosive weapons in populated areas including when principles of distinction, proportionally and precaution may have been upheld. Cluster munitions are now being used by conflict parties in Yemen – the UK as a party to the CCM should also strongly condemn this use. Following the announcement that the UK government is sending military advisors to Ukraine, we urge the British government and its advisors to condemn all use of cluster munitions by Ukrainian forces and to call for an immediate end to any use of cluster munitions. The UK should also encourage Ukraine to join the 2008 Convention on Cluster Munitions in order for Ukraine to demonstrate its commitment against future use of cluster munitions. Following investigations carried out in Ukraine, Human Rights Watch has found evidence that Ukrainian government forces have used cluster munitions on at least two occasions: in October 2014 in Donetsk City and in January 2015 in Luhansk. Evidence gathered by a special mission of the Organisation for Security and Cooperation in Europe (OSCE) has supported these findings. On both occasions civilians have been killed and injured. It is therefore of great importance and urgency that the UK does everything in its power to prevent further use of cluster munitions. As a signatory to the 2008 Convention on Cluster Munitions, the UK has a legal obligation under Article 21.2 of the Convention to “make its best efforts to discourage States not party to this Convention from using cluster munitions”. The UK should also encourage Ukraine to join the 2008 Convention on Cluster Munitions. 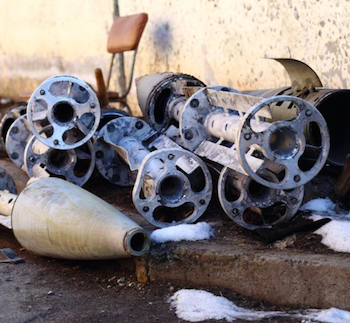 Beyond the use of prohibited weapons such as cluster munitions, we are also concerned that the use in populated areas of explosive weapons with wide area effects is contributing to a rising civilian death toll in Ukraine. The UN Secretary General, the International Committee of the Red Cross and a wide range of states have highlighted the grave humanitarian problems caused by the use in populated areas of explosive weapons with wide area effects and called on states to avoid such use. We urge the British government to raise these concerns with the Ukrainian authorities. How far away is ‘a long way away’?